Many of us were relieved that Punxsutawney Phil saw his shadow on Thursday signaling six more weeks of winter. In the context of one of the warmest Idaho winters on record, anecdotal quips and references to anthropogenic global warming (AGW), or manmade global warming, are on the increase. But of course, they can only be anecdotal since we know from the data that average global temperatures have been cooling slightly over the past decade, while manmade carbon dioxide (CO2) has been increasing steadily during the same period. AGW proponents point to man’s CO2 emissions as “causal” to AGW, but they cannot be causal. Carbon dioxide, is a naturally occurring component of our atmosphere, but does not, of itself, produce heat. So even if we, as a species, doubled the amount of CO2 in the atmosphere, it would not necessarily increase the global mean temperature since CO2 is not the cause, or origin, of heat for the planet. That said, CO2 is a greenhouse gas, which means it can trap solar heat in the atmosphere. So while it’s illogical to refer to “manmade global warming” or AGW, it is completely logical and scientific to refer to man contributing to global warming. Since CO2 is a greenhouse gas, and we generate CO2 with our carbon based transportation system and much of our energy production, we can and do have an effect on the amount of solar heat that remains in the atmosphere. Therefore we can contribute to global mean temperatures, but we cannot be the cause of it. Let’s see if we can get a handle on how much we may be contributing to global warming by examining the components of our atmosphere. Scientists tell us that our atmosphere is composed roughly (by volume) of 78.09% nitrogen, 20.95% oxygen, 0-4% water vapor, 0.93% argon, 0.039% carbon dioxide, and small amounts of other gases. Now, let’s put carbon dioxide into perspective Oceans contain 37,400 billion tons (GT) of suspended carbon and land biomass has 2,000-3,000 GT. The atmosphere contains 720 GT of CO2 and manmade emissions contribute about 6 GT. The oceans, land and atmosphere exchange CO2 continuously which means that the addition by humans is incredibly small, amounting to .00159% of the total, and .0083% of the atmospheric carbon dioxide. Can such a relatively small contribution of CO2 make a difference climatically? Probably, but it’s going to be negligible. To provide a point of reference for comparative purposes, the average household bathtub holds about 42 gallons of water. If you filled your tub and then poured in an additional half-a-teaspoon of water, that would be the equivalent of our CO2 contribution to the atmosphere. And remember, CO2 makes up just .039% of the atmosphere, which under other measuring systems would constitute no more than a “trace amount.” Water vapor is by far the most prevalent component accounting for as much as 85% of the greenhouse effect. There appears to be little correlation between the amount of CO2 emissions and global temperatures. According to corrected NASA data, the earth has cooled by about 1 degree Celsius over the past decade, about the same amount it warmed over the past century, while CO2 emissions have increased by some estimates as much as 25%. If that tiny portion that man contributes to the atmosphere was so contributory to planet warming, certainly there would be empirical correlation and actual results would more closely match Michael Mann’s discredited “hockey stick” graph. Even if all manmade CO2 emissions were immediately stopped, the effect would be negligible, as we contribute so little as a percentage to the atmosphere. Like the weather, the climate has always changed, and will continue to do so in spite of, not because of us. 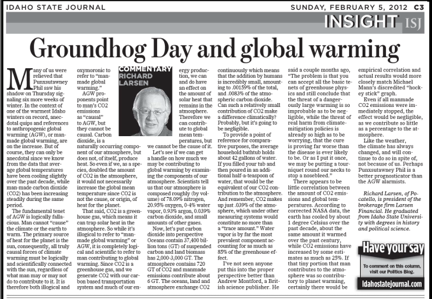 Perhaps Punxsutawney Phil is a better prognosticator than the AGW alarmists.